All intracellular proteins and many extracellular proteins are continually “turning over;” i.e., they are being hydrolyzed to their constituent amino acids and replaced by new synthesis. Although the continual destruction of cell proteins might seem wasteful, this process serves several important homeostatic functions. Individual proteins in the nucleus and cytosol, as well as in the endoplasmic reticulum (ER) and mitochondria, are degraded at widely differing rates that vary from minutes for some regulatory enzymes to days or weeks for proteins such as actin and myosin in skeletal muscle or months for hemoglobin in the red cell. Cells contain multiple proteolytic systems to carry out the degradation process and complex regulatory mechanisms to ensure that the continual proteolytic processes are highly selective. Therefore, excessive breakdown of cell constituents is prevented. Overall, the rates of protein synthesis and degradation in each cell must be balanced precisely because even a small decrease in synthesis or a small acceleration of degradation, if sustained, can result in a marked loss of mass in the organism (1). In all tissues, the majority of intracellular proteins are degraded by the ubiquitin (Ub)–proteasome pathway (UPP) (2). However, extracellular proteins and some cell surface proteins are taken up by endocytosis and degraded within lysosomes. These organelles contain several acid-optimal proteases, including cathepsins B, H, and D, and many other acid hydrolases. Some cytosolic proteins are degraded in lysosomes after being engulfed in autophagic vacuoles that fuse with lysosomes (3,4). In most cells, this process is accelerated by the lack of insulin or essential amino acids and in liver by glucagon (5). There are other cytosolic proteolytic systems in mammalian cells. The Ca2+-activated (ATP-independent) proteolytic process involves the cysteine proteases termed calpains. These proteases seem to be activated when cells are injured and cytosolic Ca2+ rises, so they may play an important role in tissue injury, necrosis, and autolysis (6). Another important family of cytosolic proteases is the caspases that cleave proteins after aspartic acid residues. These enzymes, which are cysteine proteases, are critical in destruction of cell constituents during apoptosis (7). During the past two decades, the UPP has taken center stage in our understanding of the control of protein turnover (Figure 1). The UPP consists of concerted actions of enzymes that link chains of the polypeptide co-factor, Ub, onto proteins to mark them for degradation (8,9). This tagging process leads to their recognition by the 26S proteasome, a very large multicatalytic protease complex that degrades ubiquitinated proteins to small peptides (10). Three enzymatic components are required to link chains of Ub onto proteins that are destined for degradation. E1 (Ub-activating enzyme) and E2s (Ub-carrier or conjugating proteins) prepare Ub for conjugation, but the key enzyme in the process is the E3 (Ub-protein ligase), because it recognizes a specific protein substrate and catalyzes the transfer of activated Ub to it (Figure 2). The discovery of Ub and the biochemistry of its conjugation to substrate proteins culminated in the awarding of the Nobel Prize in Chemistry in 2004 to Avram Hershko, Aaron Ciechanover, and Irwin Rose (http://nobelprize.org/chemistry/laureates/2004/). 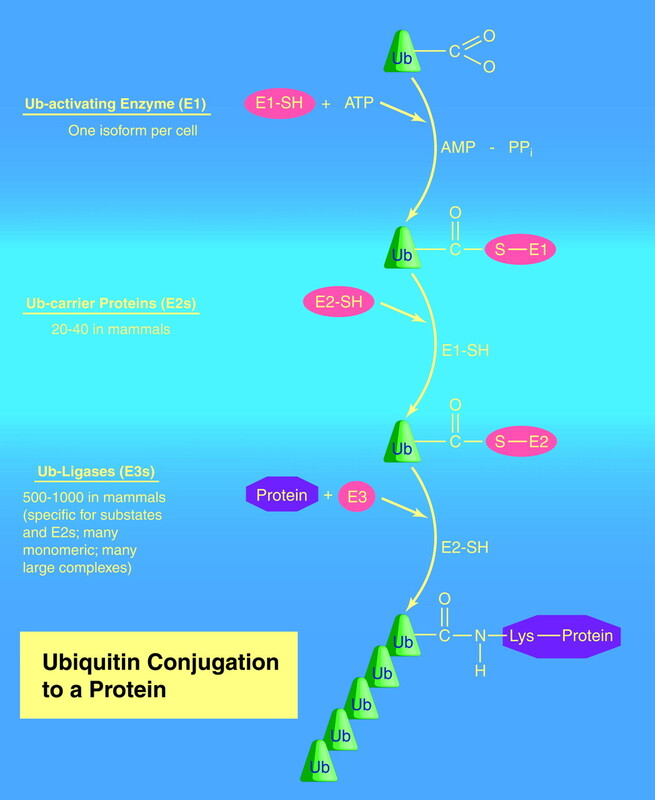 The ubiquitin (Ub)-proteasome pathway (UPP) of protein degradation. Ub is conjugated to proteins that are destined for degradation by an ATP-dependent process that involves three enzymes. A chain of five Ub molecules attached to the protein substrate is sufficient for the complex to be recognized by the 26S proteasome. In addition to ATP-dependent reactions, Ub is removed and the protein is linearized and injected into the central core of the proteasome, where it is digested to peptides. The peptides are degraded to amino acids by peptidases in the cytoplasm or used in antigen presentation. Illustration by Josh Gramling—Gramling Medical Illustration. The three biochemical steps that conjugate Ub to the protein substrate. The ATP-dependent process is repeated until a chain of Ub molecules is attached. Illustration by Josh Gramling—Gramling Medical Illustration. Since the initial description of the UPP as a protein tagging and destruction mechanism, knowledge in this area has exploded, with thousands of proteins shown to be degraded by the system and additional novel functions for Ub conjugation being uncovered. The major functions of the pathway are described next. Unlike most regulatory mechanisms, protein degradation is inherently irreversible. Destruction of a protein can lead to a complete, rapid, and sustained termination of the process involving the protein as well as a change in cell composition. The rapid degradation of specific proteins permits adaptation to new physiologic conditions. Ub conjugation affects transcription by multiple mechanisms (11). Many transcription factors are ubiquitinated and degraded by the proteasome. In fact, in many cases, transcriptional activation domains and signals for Ub conjugation directly overlap. Ubiquitination and proteolysis of activators even may stimulate transcriptional activity by removing “spent” activators and resetting a promoter for further rounds of transcription (12). In addition, transcription factors can be regulated by changes in their location. For example, NF-κB, the proinflammatory transcriptional activator, is kept outside the nucleus by its interaction with IκB. IκB degradation is triggered by its phosphorylation, which causes it to be recognized by the E3 β-transducin repeat containing protein (β-TRCP). IκB then is ubiquitinated and rapidly degraded, and the freed NF-κB translocates to the nucleus. This step is critical in acceleration of the inflammatory response (13). The UPP selectively eliminates abnormally folded or damaged proteins that have arisen by missense or nonsense mutations, biosynthetic errors, or damage by oxygen radicals or by denaturation (especially at high temperatures). In cystic fibrosis, the mutant form of the transmembrane conductance regulator protein (CFTR) is selectively degraded and therefore fails to reach the cell surface (14,15). Because the Ub conjugation and degradation machinery are cytoplasmic, the destruction of CFTR demonstrates that the UPP degrades misfolded or secreted proteins. In the process of ER-associated degradation, many misfolded proteins within the ER are retrotranslocated out of that compartment into the cytosol by a series of ER membrane–associated Ub conjugating proteins; these then are targeted to cytosolic proteasomes (16). Antigen presentation on MHC class I molecules is dependent on proteasomal function (see section titled The Proteasome and Immune Surveillance) (2). In states of inadequate caloric intake or with catabolic diseases, the overall breakdown of cell proteins, especially in skeletal muscle, increases to provide the organism with amino acids that are used in gluconeogenesis, new protein synthesis, and energy production. Activation of this process in fasting or disease can lead to muscle atrophy (see section titled Mechanisms that Cause Loss of Muscle Protein in Uremia). Ub also can be conjugated to proteins as a monomer (rather than as a typical Ub chain). This type of tagging triggers internalization of cell surface proteins into the endocytic pathway (17) and also can be used in the regulation of transcription (18). Ub is composed of 76 amino acids. Its C-terminus is a critical glycine that is required for its conjugation to other Ub molecules and substrates, and it contains internal lysine residues that are used in the creation of polyubiquitin chains. Ub is not expressed directly as free Ub but rather as linear fusions either to itself or to certain ribosomal protein subunits. These highly unusual Ub-fusion precursors are processed rapidly by deubiquitinating enzymes, yielding monomeric, Ub moieties; this is one way in which Ub is produced rapidly in times of cellular stress. Ub conjugation to cellular proteins also can be reversed by the many deubiquitinating enzymes in cells. Therefore, these enzymes free Ub from precursor fusion proteins; they also catalyze the disassembly of Ub chains. Presumably, they function to recycle monomeric Ub for use in new conjugation reactions and prevent the accumulation of polyubiquitin chains that could compete with the binding of ubiquitinated substrates to the proteasome. The initial step in conjugation of Ub onto proteins is activation of Ub at its C-terminus by the Ub-activating enzyme E1 (Figure 2). This abundant 110-kD enzyme uses ATP to generate a Ub thiolester, a highly reactive form of Ub (19). In mammalian organisms, a single, functional E1 enzyme has been found, unlike the large number of E2s and E3s in cells (20). Once activated, the Ub that is bound to E1 via the thiolester linkage is transferred to a sulfhydryl group of one of the 30 to 40 Ub carrier proteins or E2s (21). The E2s generally are small proteins that share a conserved 16-kD core that contains the cysteine that forms a thiolester linkage with the activated Ub (21). The large number of E2s helps to generate the specificity of the ubiquitination system, because specific E2s function in the degradation of various types of substrates, and they can conjugate with various E3s. The main specificity factor in the UPP is the E3 enzyme. There are >1000 E3s in cells that link Ub to proteins in a highly regulated manner. E3s catalyze the transfer of the activated Ub from an E2 initially to a lysine in the target protein and subsequently to lysines that are present in Ub, yielding a substrate-anchored chain of Ub molecules. Generally, E3s fall into two broad structural classes: They are either homologous to HECT (homologous to E6-AP carboxy-terminus) domains or RING fingers (22). HECT domain proteins are large monomeric E3s that consist of two functionally distinct domains (23). The C-terminal HECT domain (350 amino acids) accepts the activated Ub from the E2s by forming a thiolester linkage with Ub, enabling it to be transferred to the substrate. HECT-domain E3s directly bind activated Ub and are actual components of the enzymatic conjugation cascade (24). The prototypical member of this family is the E6-associated protein (E6-AP) (25). Lack of this enzyme causes Angelman’s syndrome, an inherited neurologic disorder (26). Nedd4, another HECT-E3, targets the epithelial sodium channel for internalization and degradation (27) by recognizing specific residues in the channel’s cytoplasmic tails. When these proteins cannot interact, either as a result of mutations in the sodium channel or the E3, the channel is more stable, resulting in increased sodium reabsorption, hypervolemia metabolic alkalosis, and hypertension, a genetic defect known as Liddle’s syndrome (28). The vast majority of E3s contain RING finger domains. These 40- to 60-residue zinc-binding motifs contain core amino acids, cysteine, and histidine (22,29). RING finger E3s can be monomeric enzymes or multisubunit complexes. As a whole, they seem to serve as scaffolds that bring the substrate and the E2 into close proximity, an optimal condition for Ub conjugation (29–31). Monomeric RING finger E3s include the oncoprotein Mdm2, a physiologic regulator of p53 stability in normal cells (32), and c-Cbl, which catalyzes ubiquitination of certain cell surface receptors. Two E3s that are important in the processes of muscle atrophy, muscle ring finger-1 (MuRF-1), and E3α belong to this group; E3α was among the first of the E3s to be biochemically identified. It recognizes protein substrates on the basis of their N-terminal amino acid. Proteins that begin with large basic or hydrophobic residues are targeted for ubiquitination and degradation by E3α (32a). This “N-end rule” pathway seems to be important in the destruction of cohesions (33), certain signaling molecules (e.g., regulator of G-protein signaling 4 [RGS4] ), and the enhanced protein degradation that occurs in atrophying muscle (see section titled Mechanisms That Cause Loss of Muscle Protein in Uremia). Other RING-finger E3s contain many subunits that serve as scaffolds to bring together the substrate and an E2 conjugated to an activated Ub. The largest (1.5 MDa), most complex E3 is the anaphase-promoting complex. It is important in ubiquitination of mitotic cyclins and other proteins that are involved in cell-cycle control. Cullin-RING Ub ligases form the largest group of E3s (29). The basic core of these E3s is the elongated, rigid cullin subunit. On end of these subunits bind the RING component (typically Rbx1/Roc1) and the E2, whereas at the other end, the substrate-interacting protein is bound, often through an additional adaptor protein. Because of the large number of cullins and substrate-binding subunits, the same organization using the same basic mechanism can recognize and ubiquitinate a large number of diverse proteins. The best understood group of cullin-RING ligases are the Skp1–Cul1–F-box (SCF) complexes. The F-box protein is the subunit that contains the substrate-binding motif (see below). It binds to an adaptor, Skp1, through an approximately 45–amino acid F-box motif. Substrates of SCF complexes E3s are many key molecules that control inflammation and cell growth (e.g., IκB, NF-κB, β-catenin) and cell cycle–induced proteins (e.g., the cyclin-dependent kinase inhibitor p27Kip1). In many cases, phosphorylation leads to binding of substrate to the F-box subunit and subsequent Ub conjugation. Regulated expression of F-box proteins can cause tissue- and disease-specific Ub conjugation of target proteins. For example, the F-box protein atrogin-1/MAFbx is expressed at high levels specifically in atrophying skeletal and cardiac muscle (35). In addition to phosphorylation, other types of posttranslational protein modifications can stimulate ubiquitination. For example, cellular oxygen levels are sensed by the Von Hippel-Lindau (VHL)-containing VHL-elongin BC (VBC) E3, which recognizes hydroxyproline (an oxygen-dependent protein modification). When oxygen levels are adequate in cells, the hypoxia-inducible factor 1α (HIF-1α) transcriptional activator undergoes prolyl hydroxylation and ubiquitination by this E3. When oxygen pressure falls, the unmodified HIF-1α is not recognized by VHL and is not degraded, so it triggers transcription of genes for angiogenesis (vascular endothelial growth factor, erythropoietin, and glycolytic enzymes ). The VBC complex is another cullin-RING ligase, made up of Cul2 and a substrate-interacting domain that is made up of VHL and the adaptors elonginB and elonginC. VHL mutations are associated with highly vascular tumors in the kidney, presumably as a result at least in part of the presence of stable, active HIF-1α. Other protein modifications that have been shown to recruit E3s include glycosylation, nitrosylation, and deacetylation. Substrate modification adds another layer of regulation to the UPP by integrating cell signaling and metabolic pathways with the conjugation-degradation machinery. Recently, a novel group of enzymes with Ub ligase activity have been identified: The U-box domain proteins, such as Ub fusion degradation protein 2 (UFD2) and C-terminal of Hsp-70-interacting protein (CHIP). These E3 enzymes contain atypical RING finger motifs (37). CHIP is important for the removal of abnormal proteins such as the misfolded CFTR in cystic fibrosis and tau protein of polyglutamine repeat proteins that are present in several neurodegenerative diseases (38). Degradation of these proteins begins when they are bound by specific molecular chaperones followed by binding of the E3s. This leads to selective ubiquitination of the chaperone-bound substrate. 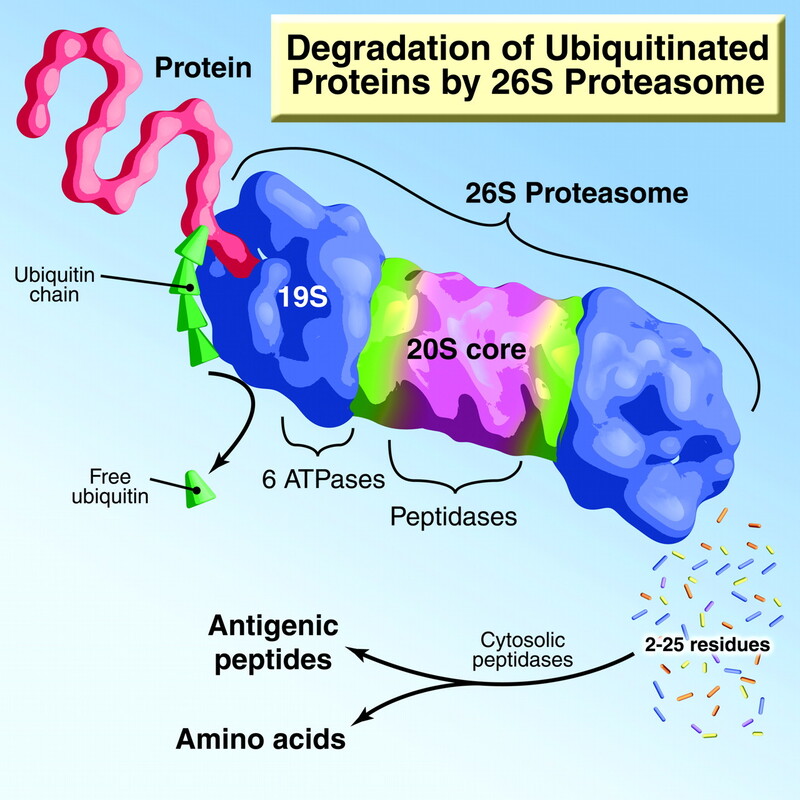 The rapid degradation of ubiquitinated proteins is catalyzed by the 26S proteasome. This structure is found in the nucleus and the cytosol of all cells and constitutes approximately 1 to 2% of cell mass (39). The 26S particle is composed of approximately 60 subunits and therefore is approximately 50 to 100 times larger than the typical proteases that function in the extracellular environment (e.g., in digestion, blood clotting) and differs in critical ways. The most fundamental difference is that it is a proteolytic machine in which protein degradation is linked to ATP hydrolysis. The 26S complex is composed of a central barrel-shaped 20S proteasome with a 19S regulatory particle at either or both of its ends (Figure 3) (8,39,40). The 20S proteasome is a hollow cylinder that contains the mechanisms for protein digestion. It is composed of four stacked, hollow rings, each containing seven distinct but related subunits (39). The two outer α rings are identical, as are the two inner β rings. Three of the subunits in the β rings contain the proteolytic active sites that are positioned on the interior face of the cylinder. The outer α subunits of the 20S particle surround a narrow, central, and gated pore through which substrates enter and products exit (41). Substrate entry is a complex process that is catalyzed by the 19S particle. This complex architecture evolved to isolate proteolysis within a nano-sized compartment and prevents the nonspecific destruction of cell proteins. One can view protein ubiquitination and the functioning of the 19S particle as mechanisms that ensure proteolysis as an exquisitely selective process; only certain molecules get degraded within the 20S proteasome (42). The 26S proteasome structure includes the 20S core that contains the unique proteolytic sites that break peptide bonds. The 19S caps cleave off the Ub chain and use ATPases to unfold the protein substrate and translocate it into the 20S core particle for degradation into peptides. Illustration by Josh Gramling—Gramling Medical Illustration. The 19S regulatory particles on the ends of the 20S proteasome are composed of at least 18 subunits (8,39). Its base contains six homologous ATPases in a ring and adjoins the outer ring of the 20S particle. These ATPases bind the proteins to be degraded and use ATP hydrolysis to unfold and translocate the protein into the 20S particle (43). The 19S’s outer lid contains subunits that bind the polyubiquitin chains plus two deubiquitinating enzymes (also called isopeptidases) that disassemble the Ub chain so that the Ub can be reused in the degradation of other proteins (8). There is growing evidence that additional factors associate with the 19S particle and actually help deliver ubiquitinated proteins into the particle (44). 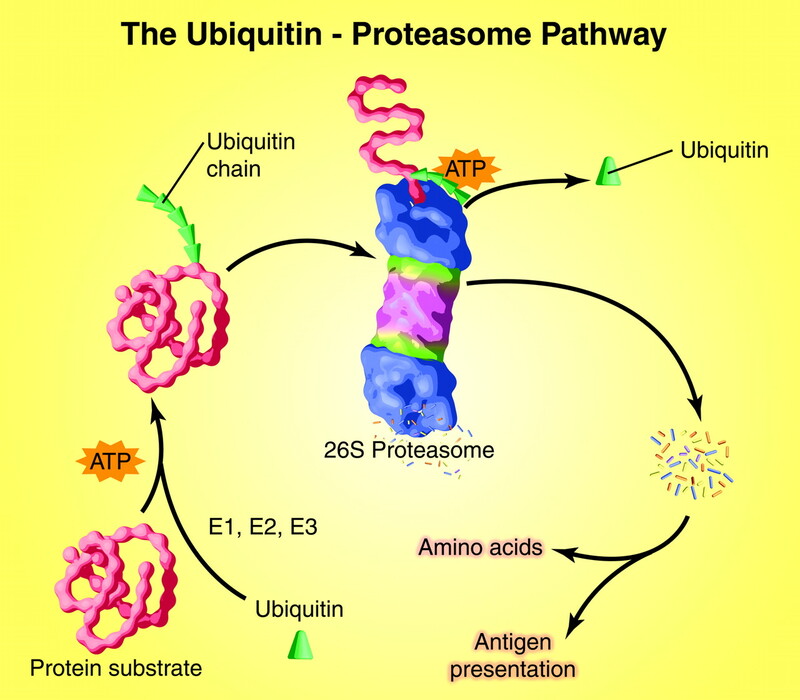 Although the 26S complex catalyzes the degradation of ubiquitinated proteins, it can digest certain proteins without ubiquitination (especially damaged proteins); it remains uncertain how important this activity is in vivo (45). Much has been learned about the mechanisms by which a ubiquitinated protein is degraded. After it binds to the 19S component, the polyubiquitin chain is cleaved off the substrate and disassembled. The protein is unfolded somehow by the six ATPases in the base of the particle (43). Linearization of the folded protein is essential for it to be translocated through the gated entry channel into the 20S particle because this pore, even in its open state, is too narrow for globular proteins (i.e., most cell proteins) to enter (8,41). The ATPases also act as a “key in a lock” to cause opening of the gated, substrate entry channel of the 20S outer ring and into its central degradative chamber (46). Linearizing and delivering the substrate utilizes significant energy, perhaps one third as much ATP as the ribosome would use in synthesizing the protein, but it ensures the efficient and regulated elimination of the protein (43). After the substrate enters the 20S’s central chamber, the polypeptide is cleaved by its six proteolytic sites on the inner face of the changer, forming small peptides that range from three to 25 residues in length (47). Unlike traditional proteases, which cut a protein once and release the fragments, the proteasome digests the substrates all the way to small peptides that exit the particle. Peptides that are released by the proteasome only exist in the cell for seconds, because they are quickly digested into amino acids by the abundant cytosolic endopeptidases and aminopeptidases. The amino acids can be reutilized to synthesize new proteins or metabolized, yielding energy (48,49). Although the proteasome principally catalyzes the complete hydrolysis of cell proteins, in a few cases, the 26S proteasome degrades proteins only partially, yielding a biologically active fragment. An example of the latter activity is the generation of a subunit of the transcription factor NF-κB (50). For NF-κB to be functional in inflammatory processes, the proteasome must digest an inactive precursor molecule and release one half, which functions in transcriptional regulation. In its central chamber, the proteasome contains six proteolytic sites: Two cleave preferentially after hydrophobic amino acids, two cleave preferentially after basic residues, and two cleave after acidic ones (39,40). The proteasome’s active sites (like the set of proteases in the lysosome and pancreas) therefore have the capacity to degrade nearly all the various types of amino acid sequences that are found in proteins. One interesting exception that the proteasome’s active site cannot cut is repeated sequences of glutamines. This exception seems to be important in the pathogenesis of certain neurodegenerative diseases (e.g., Huntington’s disease) that result from a genetically linked series of polyglutamines within certain proteins (51). Apparently, the glutamines are poorly degraded and accumulate as toxic, intracellular inclusions. The active sites in the proteasome cleave peptide bonds by a unique mechanism; peptide bonds are cleaved by the hydroxyl group on a critical threonine residue (45). Because the proteolytic mechanism is novel, highly specific inhibitors of the active sites have been synthesized (or microorganisms have produced them) (40). These inhibitors (e.g., MG132, lactacystin, epoxymycin) have been used widely as research tools that have enabled investigators to discover many of the key functions of the UPP. One such synthetic inhibitor, Bortezomib (Velcade, PS-341) has emerged as an important new anticancer drug. Bortezomib has been approved by the US Food and Drug Administration and is widely used for the treatment of multiple myeloma; clinical trials against various other cancers are under active investigation (47,52). The proteasome inhibitors initially were synthesized in an attempt to develop agents that could block the excessive breakdown of muscle proteins in various cachectic states (see section titled Mechanisms That Cause Loss of Muscle Protein in Uremia), but it was discovered that they also could block the activation of NF-κB (50), the critical transcription factor that mediates production of many inflammatory cytokines. NF-κB also has important antiapoptotic roles that could block the death of cancer cells. However, inhibition of the proteasome was found to induce apoptosis, especially in neoplastic cells and transplanted tumors (40). With the backing of the National Cancer Institute, these agents went into human trials against various cancers, and the special sensitivity of myeloma cells became evident in phase I trials (52). Surprising, these agent have therapeutic efficacy, even when protein degradation by the proteasome in cancer cells is only partially compromised. Apparently, the myeloma cells are particularly dependent on NF-κB for production of essential growth factors (especially IL-6). In addition, malignant plasma cells produce exceptionally large amounts of abnormal Ig that are degraded by the ER-associated degradation–proteasome pathway (see section titled The Proteasome and Immune Surveillance). However, promising responses have been obtained in patients with other hematologic malignancies, and Bortezomib in combination with other chemotherapeutic agents is being tested against other malignancies in clinical trials. Our understanding of the mechanism by which proteasome inhibitors synergize with various cytotoxic agents is incomplete, but combating the antiapoptotic effects of NF-κB, especially after there is DNA damage, is an attractive possibility. Surprising, proteasome inhibitors also have benefits in animal models of strokes. The compounds seem to reduce postischemia adhesion of cells and reperfusion injury. Again, the mechanism might involve combating the influence of NF-κB. Human trials of the compounds in treatment of strokes soon will be undertaken. Notably, these applications initially were not recognized and probably could not have been predicted. In short, the development of proteasome inhibitors that exhibit several biologic properties emphasizes the enormous benefits that are emerging from basic biochemical research. Besides essential roles in regulating cell growth and metabolism and in the elimination of misfolded proteins, the UPP serves a critical role as an information-gathering mechanism for the immune system (2,47,53). In higher vertebrates, the proteasome along with the cell’s other proteolytic apparatus, the lysosome, generates antigenic peptides that are presented to the immune system. These peptides enable circulating lymphocytes to screen for foreign proteins in the extracellular and intracellular environments. 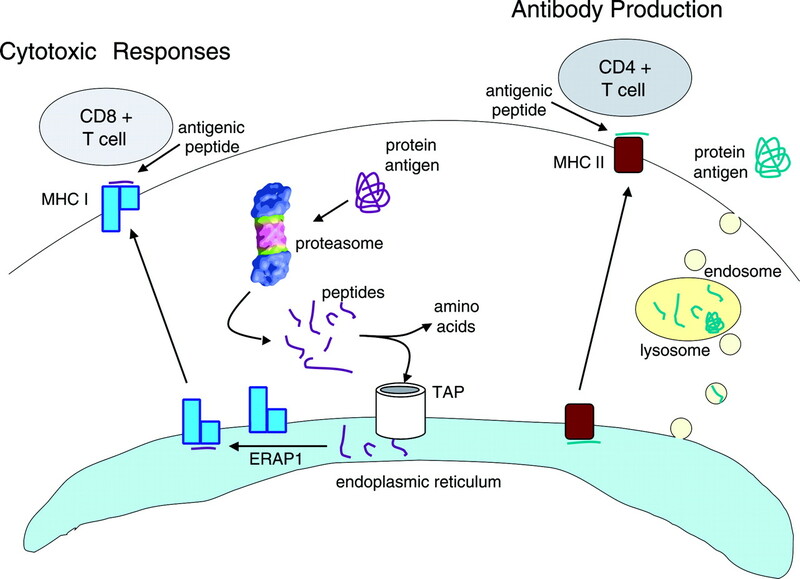 Extracellular proteins that are taken up by endocytosis of antigen-presenting cells are degraded by the lysosome; this process provides the antigenic peptides that are presented on MHC class II molecules to CD4+ lymphocytes. These lymphocytes are activated to produce antibodies (Figure 4). The generation and presentation of antigenic peptides. Intracellular proteins are degraded by the UPP and imported into the endoplasmic reticulum, where they are processed and lead to binding to MHC class I receptors. CD8-positive T cells respond to the antigen. Extracellular proteins that are endocytosed and degraded to peptides in lysosomes are processed to bind to MHC class II receptors. CD4-positive T cells respond to these antigens. Illustration by Josh Gramling—Gramling Medical Illustration. The continual breakdown of intracellular proteins as may arise during viral or bacterial infection or with cancer allows the immune system to screen for non-native proteins within cells (2,53,54). Although the great majority of peptides that are generated by the proteasome during breakdown of intracellular proteins are digested rapidly to free amino acids (49,55), some escape this fate and are transported into the ER. In the ER, they bind to MHC class I molecules and are delivered to the cell surface for presentation to cytotoxic CD8+ lymphocytes (Figure 4) (2). When non-native epitopes (e.g., ones derived from viruses) are presented on the cell surface, the presenting cells are killed quickly by cytotoxic T cells. This critical role of the proteasome in antigen presentation was demonstrated first through the use of proteasome inhibitors (54). These inhibitors proved invaluable in the elucidation of this immunologic process (2,56). To bind to most MHC class I molecules, peptides have to be eight to nine residues long. Approximately 70 to 80% of proteasome products are too small to serve as antigens (56). The products that are used as antigenic precursors not only are the eight- to nine-residue peptides but also the longer ones with additional amino acids on their amino termini. They are taken up into the ER by a specific peptide transport system, called transporter associated with antigen processing (TAP). Within the ER is a newly discovered aminopeptidase, endoplasmic reticulum aminopeptidase 1 (ERAP1), which has the unusual capacity to trim extra amino acids off the longer precursors and then stops at eight to nine residues, the precise length for binding to MHC molecules (53,57,58). In inflammatory conditions, the immune cells (e.g., spleen or thymus cells) develop several adaptive mechanism functions that enhance the efficiency of antigen presentation (54). In response to the immune modifier γ-IFN, immune cells express novel types of proteasomes, termed immunoproteasomes, which play a major role in enhancing MHC class I presentation. The immunoproteasomes differ because they contain three novel peptidase subunits in place of the proteases that normally are present. These specialized subunits exhibit different specificities that enable them to cleave proteins differently so that more of the products have the correct features for processing to peptides that are capable of binding to MHC class I molecules (54,59). In addition, γ-IFN induces a special proteasome-activating complex, PA28. It binds to one end of the 20S proteasome and forms a hybrid 26S particle that has a 19S complex at the other end (60). These hybrid particles degrade ubiquitinated proteins at normal rates but cleave them differently, generating an even higher fraction of peptides that are capable of serving as antigenic precursors. At the same time, γ-IFN can cause cells to express higher amounts of the TAP transporter, the ERAP1 peptide trimming enzyme, and MHC molecules (54,56,57). Together, these changes stimulate the host defense. Presumably, antigen processing by these systems normally functions well below maximal levels until activation of the host’s defenses is necessary. However, a number of viruses have evolved sophisticated mechanisms to escape immune detection by inhibiting the uptake of proteasome products into the ER by the TAP transporter or by promoting the degradation of MHC class I molecules (55). This competition between immune defenses and viruses demonstrates that the immune systems in higher vertebrates have evolved in terms of modifications of the UPP that otherwise is highly conserved in organisms from yeast to human. These alterations in proteasome structure and the changes in the proteolytic pathway allow efficient antigen presentation and, therefore, the basal recognition of infected or neoplastic cells and their rapid elimination under a variety of conditions. The maintenance of tissue mass and body protein stores in normal adults occurs when cells achieve a balance between the rates of synthesis and degradation of cell proteins. In uremic patients, protein stores frequently are depressed: Serum albumin is low, and there is weight loss largely as a result of loss of muscle mass (61,62). This decrease in body protein has been attributed to “malnutrition” (i.e., an insufficient or imbalanced diet), but, in fact, it results from complex physiologic and biochemical adaptations (63,64). In experimental animals and humans with uremia, overall rates of protein synthesis generally are unchanged, whereas rates of protein degradation tend to increase (65,66). Because the rates of protein turnover in cells are very high (3.5 to 4.5 g protein/kg per d) (1), even a small increase in proteolysis, with time, will cause marked protein depletion. Most of this acceleration of protein degradation in muscle in disease states occurs via a programmed activation of the UPP (66,67). Recent studies in rodent models have established that accelerated muscle protein catabolism that is induced by uremia involves similar cellular mechanisms that cause muscle wasting in a variety of other catabolic conditions, such as cancer cachexia, starvation, insulin deficiency, or sepsis (1). Atrophying muscles from such animals show accelerated proteolysis via the UPP, higher levels of mRNA that encode certain components of this proteolytic system, and a similar pattern of changes (both increases or decreases) in the expression of approximately 100 atrophy-related genes, also termed atrogenes (35) (Table 1). In humans with these conditions, there also is evidence for activation of the UPP in muscle (e.g., an increase in mRNA that encode Ub and proteasome subunits) (67–70). In these catabolic states, the increase in mRNA levels for these atrophy-related genes in muscle occurs through increased gene transcription (35,66,71,72). As part of this common transcriptional program, the expression of various growth-related genes decreases in the atrophying tissues (35). Therefore, multiple transcriptional factors seem to change coordinately to bring about the loss of muscle mass. The strongest evidence for activation of the UPP muscles of animals that undergo atrophy as a result of uremia (or other catabolic diseases) is that when studied in vitro, muscles from these models exhibit increased proteolysis that can be blocked by inhibitors of the proteasome (66,71,73). For these reasons, muscle wasting represents a specific, carefully orchestrated response that is triggered by various stimuli in various pathologic conditions (e.g., acidosis in renal failure, low insulin levels in fasting and diabetes, inactivity, glucocorticoids or cytokines in sepsis). In fasting and presumably in other disease states, an identifiable function of accelerated proteolysis is to mobilize amino acids from dispensable muscle proteins to provide the organism with precursors for hepatic gluconeogenesis or for new protein synthesis (1). However, these losses can have deleterious effects with time, especially in renal failure, in which disposal of nitrogenous waste is compromised, and they accumulate to cause symptoms and metabolic problems. Because the UPP serves many essential functions in cell regulation and homeostasis, its activation in these states must be highly selective and precisely regulated to avoid the unwanted removal of muscle proteins that are essential for cell function in muscle and other organs. Whereas atrophy seems to affect all muscle cell components, contractile proteins are lost differentially. The specificity of the UPP in protein breakdown is determined by the cell’s content of Ub ligases (E3s), which, as discussed, target specific sets of proteins for degradation. The cellular content of E3s varies among tissues and physiologic states. Two Ub ligases, atrogin-1 (also known as MAFbx) and MuRF-1, are specific constituents of muscle; their expression increases dramatically (eight- to 20-fold) in catabolic states, and they play a critical role in mediating the loss of muscle protein (Figure 5). In mice that lack the genes for atrogin-1 or MuRF-1, muscles grow normally, but if they are denervated, then the rate of muscle atrophy is reduced (74). Muscles of these knockout mice also show reduced atrophy upon fasting. In wild-type animals that are subjected to muscle denervation or disuse, expression of atrogin-1 and MuRF-1 rises quickly just when muscle atrophy is most rapid, and in cultured muscle cells, the content of atrogin-1 mRNA correlates tightly with rates of protein breakdown (75–77). Therefore, the muscle’s content of atrogin-1 mRNA is an excellent biomarker for the rates of proteolysis and rapid wasting. The balance between protein synthesis and degradation determines whether muscles hypertrophy or atrophy. With hypertrophy, protein synthesis exceeds degradation because the phosphatidylinositol 3 kinase (PI3-K)/Akt pathway stimulates protein synthesis and phosphorylates the FoxO transcription factors that stimulate protein degradative processes. In diseases that suppress insulin/IGF-1 signaling, the PI3-K/Akt pathway is depressed, leading to decreased protein synthesis and FoxO phosphorylation. This allows FoxO to stimulate the expression of the E3 enzymes atrogin-1 and muscle ring finger-1 (MuRF-1) and protein degradation. Another stimulus, inflammatory cytokines such as TNF-α, increases the activation of NF-κB, leading to expression of the E3 enzyme MuRF-1 and protein degradation. Illustration by Josh Gramling—Gramling Medical Illustration. Are there other functions for atrogin-1/MAFbx? Studies in cultured skeletal muscle cells and in transgenic mice that overexpress atrogin-1 in heart muscle have suggested that myoD and calcineurin A might be substrates for ubiquitination by atrogin-1 (38,78). It is unlikely that degradation of myoD by atrogin-1 will explain the mechanism of muscle atrophy, because myoD is critical for the differentiation of muscle cells during development, whereas atrogin-1 is expressed in fully differentiated muscle only during wasting. It is not known whether calcineurin A is a target of atrogin-1 in skeletal muscle, but in terms of maintaining muscle mass, calcineurin signaling pathways seem to affect fiber type more than fiber size (79). MuRF-1 was found to interact with glucocorticoid modulatory element binding protein-1, a glucocorticoid-modulated nuclear protein that regulates transcriptional responses (80). It is intriguing that glucocorticoids are potent activators of muscle protein breakdown and that MuRF-1 expression is increased in the presence of glucocorticoids. MuRF-1 has been found to associate with and conjugate Ub to troponin I in cardiac muscle; it is not known whether MuRF-1 serves a similar function in skeletal muscle (81). As discussed below, the FoxO and NF-κB transcription factors act on the promoters for atrogin-1 and MuRF-1 to stimulate their expression, respectively. When activated, FoxO and NF-κB cause profound muscle wasting through induction of these E3s together with other atrogenes (75,82,83). Because muscle atrophy that is caused by uremia and other catabolic diseases requires activation of UPP generally and atrogin-1 and MuRF-1 specifically (35,82), efforts are being pursued to reduce the activities of the Ub proteasome pathway or to prevent the induction or activation of these E3s as means of slowing muscle wasting. It is not known how the evidence of inflammation that frequently is present in patients with kidney disease affects muscle protein degradation (64). Recently, a homologue of E3α, E3α-II, was identified by Han and colleagues (84). They found a dramatic upregulation of E3α-II in atrophying muscles of tumor-bearing rodents. Their results suggest that E3α-II or a combination of E3α and E3α-II may be responsible for the increased rates of Ub conjugation to muscle proteins by the N-end rule pathway. Myofibrillar proteins, which comprise approximately two thirds of the protein in muscle, require additional mechanisms for their degradation in addition to the UPP. Other steps are necessary because the UPP readily degrades the main components of the myofibril (actin, myosin, troponin, or tropomyosin). These same proteins are digested only very slowly by the UPP when they are present as complexes or in intact myofibrils (85). Recent findings suggest that these proteins initially are cleaved by cytosolic proteases, which promote myofibrillar disassembly to facilitate degradation of constituent proteins by the proteasome. Cleaved components of myofibrils may be recognized by E3α, the N-end rule E3 that recognizes certain amino terminal amino acids (86–88). Because most proteins have N-terminal amino acids that are not recognized by E3α, the initial cleavage of myofibrils might explain why activity of the N-end rule pathway in muscle extracts from catabolic animals is increased. Because another protease must breakdown the complex structure of muscle to provide substrates for the UPP, we tested whether caspases may play this critical initial role. Indeed, several catabolic states (sepsis, renal failure) are characterized by high circulating levels of TNF-α or insulin resistance, conditions that induce programmed cell death by activating the caspase cascade (89–91). We found that caspase-3 cleaves actomyosin in vitro and in cultured muscle cells to produce and yields substrates that are degraded rapidly by the UPP as well as a 14-kD C-terminal fragment of actin that accumulates in the insoluble fraction of the cell (92). The same processes occur in the muscle of animals with uremia, diabetes, and angiotensin II–induced hypertension, and in humans, a similar 14-kD actin fragment is found in muscle of patients with muscle atrophy as a result of disuse from the pain of osteodystrophy and related to either hemodialysis treatment or burn injury (92–94). Another family of proteases, the calpains, also has been suggested as a mechanism that catalyzes the initial cleavage of myofibrillar proteins in atrophy. Calpains are calcium-dependent cysteine proteases that have been suggested to play roles in several disorders, especially muscular dystrophy. Evidence for calpain’s activation has been reported in muscles of animals with sepsis (95). Although inhibition of the calcium-activated proteases in muscles from rodents with uremia or several other types of atrophy has not been found to block the increase in protein degradation or the degradation of myofibrillar proteins or the accumulation of the 14-kD actin fragment in muscle cells (92), the transgenic expression of calpastatin, an endogenous calpain inhibitor, can reduce denervation atrophy and progression of muscular dystrophy in mice (96). Additional studies are needed to determine whether different catabolic disorders stimulate caspase-3 and/or calpains and their specific roles of these proteases in the breakdown of different muscle proteins. Chronic kidney disease is associated with several physiologic complications that can trigger the UPP to breakdown muscle protein, metabolic acidosis, decreased insulin action, increased glucocorticoids, high levels of angiotensin II, and inflammation (66,71,93,97). These complications seem to be related to and function in concert to bring about protein loss. For example, metabolic acidosis stimulates muscle protein breakdown by the UPP, but it also increases glucocorticoid production and causes insulin resistance in muscle. Either of these clinical problems can activate the UPP and the breakdown of muscle protein (72,90,98–100). Glucocorticoids also suppress insulin sensitivity, and insulin deficiency or insulin resistance increases production of these hormones (72,100,101). Finally, the sensitivity of muscle to catabolic signals, such as glucocorticoids, rises with inactivity. Angiotensin II infusion into rodents causes both anorexia and muscle protein losses by mechanisms that depend on glucocorticoids (93). Last, inflammatory mediators suppress insulin responses, and various conditions that are associated with inflammation (e.g., arthritis) can cause muscle wasting, but the link between the increase in inflammatory markers (e.g., C-reactive protein and other acute-phase reactant proteins) in uremic patients and their loss of muscle mass has not been established (83,102). As noted, activation of the UPP in various types of muscle wasting and the coordinated changes in the expression of a set of genes in muscle suggest that these catabolic states activate a common cellular signaling pathway (35). 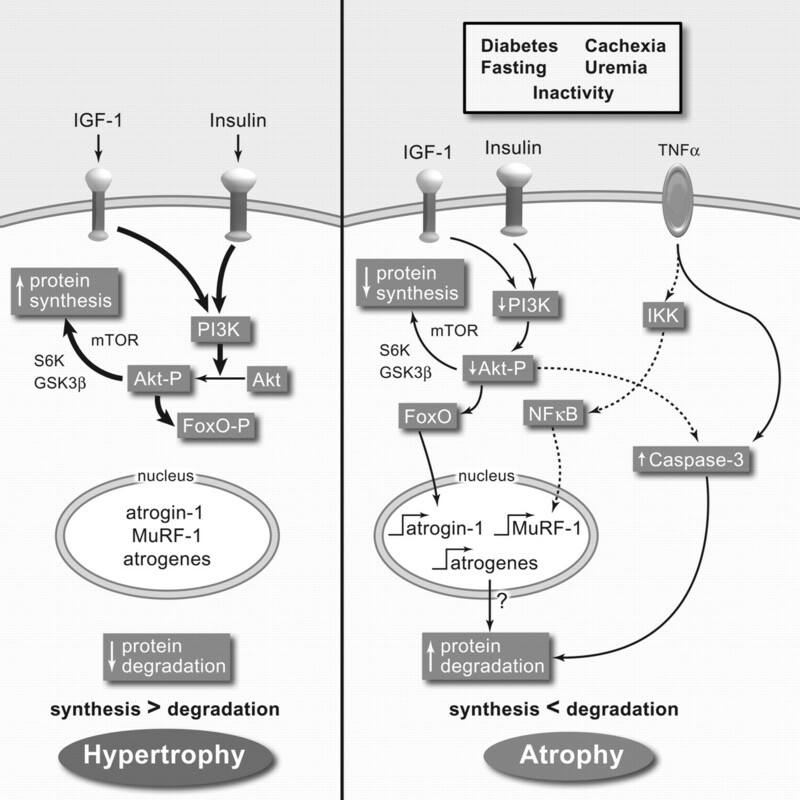 Recent studies have established that in fasting and, presumably, other insulin-deficient states, the fall in protein synthesis and the rise in proteolysis are linked events that occur through decreased signaling by the phosphatidylinositol 3-kinase/Akt (PI3-K/Akt) pathway, which in normal individuals is activated by insulin or IGF-1 (82,103,104). IGF-1 is released by the liver and mediates the anabolic effects of the growth hormone, but it also is an autocrine factor that is released by muscle after exercise. In fasting and disease, when insulin signaling is low, the activity of PI3-K is reduced and there is less production of phosphatidylinositol-3,4,5 phosphate, the active product of PI3-K; the decrease in this regulatory molecule decreases the phosphorylation and activity of the serine/threonine kinase Akt (Figure 5). Activated Akt is a major activator of growth-related processes, and, when overproduced, Akt causes muscle hypertrophy via phosphorylation of the downstream kinases glycogen synthase kinase 3β (GSK3β) and mammalian target of rapamycin (mTOR)/S6kinase, which enhance protein synthesis by ribosomes. In many types of atrophy, the reduction in signaling by the PI3-K/Akt pathway leads to reduced mRNA translation and protein production. Rapid atrophy, however, also requires enhanced proteolysis and induction of the E3 atrogin-1 and MuRF-1, leading somehow to enhanced protein degradation in muscle cells (75,76,82). These recent results show that activation of protein degradation and induction of these E3 enzymes in atrophying muscles also result from a decrease in activated Akt (i.e., phosphorylated Akt). One of the targets of activated Akt is the forkhead family of the transcription factors (FoxO1, 3, and 4); when they are not phosphorylated, they migrate into the nucleus and catalyze the transcription of atrogin-1 (75,76,82). Conversely, insulin and IGF-1, by activating PI3-K and Akt, phosphorylate FoxO and suppress expression of atrogin-1 (Figure 5). In addition to activating atrogin-1/MAFbx, the activation of FoxO will stimulate the cell’s other proteolytic system, the autophagic-lysosomal pathway. This pathway seems to catalyze the degradation of particular cellular components, especially mitochondria. The influence of Akt on the other critical E3 Ub ligase, MuRF-1, is somewhat less clear, but decreased phosphorylation of Akt was found to increase MuRF-1 and atrogin-1 transcription after glucocorticoid treatment or denervation (76). There also is emerging evidence that an unrelated transcription factor, NF-κB, can cause overproduction of MuRF-1 and muscle atrophy. Like FoxO3, NF-κB, if overproduced, can cause dramatic muscle atrophy and also seems to be required for muscle denervation or disuse atrophy and cancer cachexia (83,105). In the various conditions that are associated with muscle atrophy, both transcription factors seem to contribute to muscle wasting, but their relative importance remains to be resolved. Besides controlling the expression of E3 Ub ligases, activation of the insulin/IGF-1–-PI3-K/Akt pathway suppresses activation of caspase-3. This would decrease the breakdown of the complex structure of muscle proteins. In insulin-deficient rats that exhibit accelerated muscle protein degradation, we found that the proapoptotic factor Bax is activated, leading to the release of cytochrome C from mitochondria, which in turn activates caspase-3 and increases production of the 14-kD actin fragment (82). Similar changes were seen in cultured muscle cells with genetic or pharmacologic inhibition of PI3-K activity. Together, these recent developments provide evidence that the activation of muscle protein loss in kidney disease and other catabolic conditions occurs through a common signaling pathway that alters transcription of key enzymes that modulate protein synthesis and degradation in complementary ways to cause muscle wasting. One of the key endocrine factors that are essential for these catabolic responses is glucocorticoids. Administration of high doses of these hormones to rodents, like Cushing’s syndrome in humans, stimulates protein degradation in muscle via atrogin-1, and this response requires FoxO activation (77,106,107). In vivo, glucocorticoids can inhibit insulin/IGF-1 responses, by complex mechanisms. These hormones also exert permissive effects that activate the UPP when other catabolic signals are present. For example, activation of muscle proteolysis does not occur in adrenalectomized animals that are starved or treated with NH4Cl to induce metabolic acidosis or made insulin deficient unless the animals are given a physiologic dose of glucocorticoids (72,108,109). Similarly, the increase in muscle proteolysis that is induced by angiotensin II or sepsis can be blocked by inhibiting the glucocorticoid receptor (93). It is important to note that in these experiments, the same physiologic levels of cortisol did not stimulate muscle protein degradation unless the animals also were acidotic or made insulin deficient; normal animals require higher, pharmacologic doses to cause muscle wasting. These complex regulatory interactions actually make “physiologic sense” because glucocorticoids evolved to integrate stress responses in various tissues. When glucose is needed, an increase in glucocorticoids mobilizes amino acids from muscle protein. At the same time, these hormones induce gluconeogenic enzymes in liver that catalyze conversion of the amino acids to glucose and urea. In this brief review of the UPP, we have discussed how the complex series of biochemical reactions within this pathway act to tag and degrade proteins. Because the UPP is responsible for the turnover of so many different cellular proteins, there are critical mechanisms that regulate its function precisely. We have emphasized the importance of the UPP in the turnover of transport proteins, in presenting antigens to the immune system, and how uremia activates the UPP to cause muscle wasting because these functions are of special interest to nephrology. However, the UPP also plays important roles in the regulation of other cellular functions, ranging from the control of the cell cycle to activities that promote cancer. Indeed, inhibitors of proteasome activity, the final component of the pathway, have emerged as novel chemotherapeutic agents. Involvement in such a wide range of functions explains why the 2004 Nobel Prize in Chemistry was awarded for the discovery of Ub and its role in orchestrating cellular protein turnover. This study was supported by National Institutes of Health grants R01 DK62307 (S.H.L. ), R01 GM51923, R01 GM46147 (A.L.G. ), and DK37175, and P50 DK64233 (W.E.M. ).